Sasquatch 2011: Basia Bulat, Live In Concert As she introduced more collaborators and strumming instruments (guitar, autoharp, charango, etc.) throughout her set, it became evident why the Ontario singer-songwriter has been winning over audiences: She never appeared to stop smiling. Basia Bulat performs at the 2011 Sasquatch Music Festival. 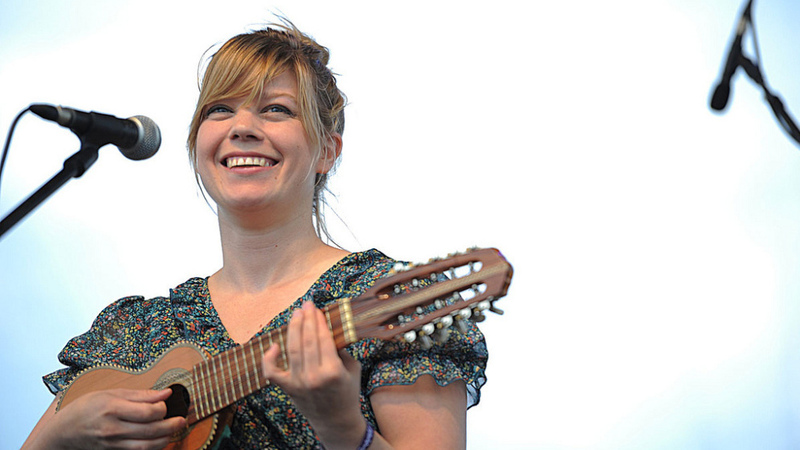 Lately, Basia Bulat has been playing a new song, with a new instrument: the 10-string, ukelele-like South American charango. ("Small but loud — like me," she announced.) "It Can't Be You" is a solo vehicle, and at Sasquatch, the Ontario singer-songwriter led off with it, intoning forcefully and strumming lustily into the afternoon. As she introduced more collaborators and instruments (guitar, autoharp, etc.) throughout a short and sweet set, it became evident why Bulat has been winning over audiences: You could hear that she never stopped smiling. Recorded live at The Gorge on Sunday, May 29, Basia Bulat performs here as part of the 2011 Sasquatch Music Festival outside Seattle, Wash.